We all want new clients, but how do you focus on attracting clients that are the most profitable and valuable for your agency? Most agencies know that defining their brand (both what it is and what it isn't) is essential for building awareness and equity, but it can be difficult to actually execute. Building an ideal client profile is the first step to understanding which targeted marketing materials to create, how you should prospect for new clients in a purposeful way, and how to better serve the clients that are the best fit for your agency. This guide will walk you through the process of creating an ideal client profile and will help you attract the best type of client for your agency! 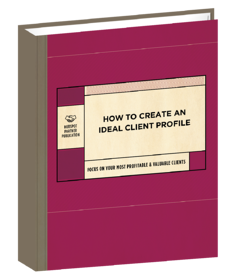 Download the guide to learn how to create an ideal client profile today!